Beauty tip lists are my kryptonite. I just love learning about what different people do with their hair or makeup — seeing what works for them, what they spend time and money on, and where they’ve found shortcuts is absolutely fascinating. One of the best tips I ever read was that a good haircut (and color, if you’re like me and haven’t rocked your natural shade in … a while) is the best beauty investment you can make. Think about it. You wear your hair every single day, and when it’s cut in a way that makes styling easy, getting ready each day takes way less effort. I’ve also found that, when I have a good cut and use products that are really hydrating, I can — for the first time in my life — embrace the texture in my hair and do the ol’ wash and go. This is a game changer for me, and it’s not like I’m relying on fancy salon products to make it happen. I’ve used Herbal Essences for ages, and when they reached out to say that they were launching nine new collections (using a technology called bio:renew), I believe I (virtually) elbowed Jenn out of the way so I’d get a chance to try it out. 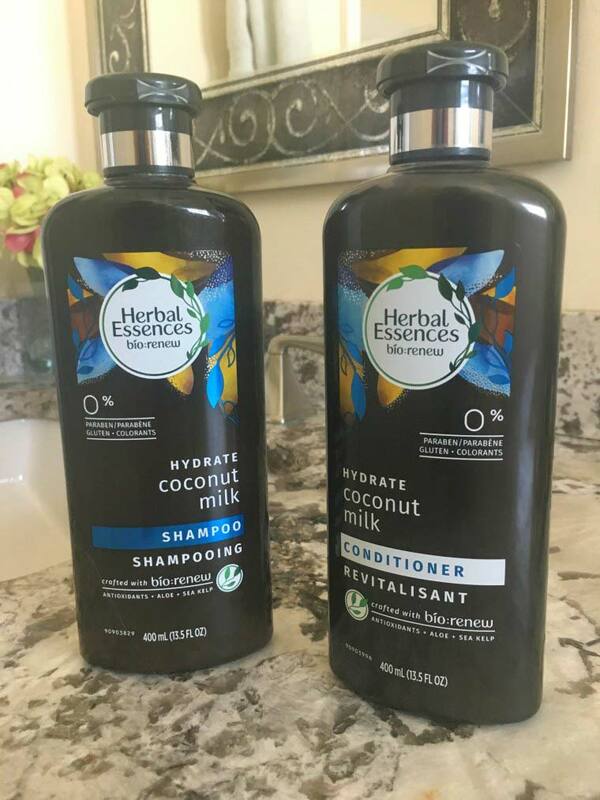 I’ve been using their Coconut Milk Collection shampoo and conditioner ($5.99 each), and it’s been awesome. Smells great, my hair feels soft and smooth … total win. Of course, you guys know me. I really enjoy playing around with hair so below, you’ll find a few tips from me on how to rock some sweet braids. And since I don’t walk out the door with wet hair (or braids) every day — and I know many of you don’t, either — I also grabbed a few tips for looking fab in a jiffy from Herbal Essences’ celeb stylist Charles Baker Strahan. The other thing I’ve learned recently is that braids aren’t just for show. My hair is longer than it’s been in years, and between that and the added texture, if I run with it just in a pony? GOOD LUCK getting a brush through it afterward. So, I’ve taken to using lots of braids. They’re super functional, but also look really special! 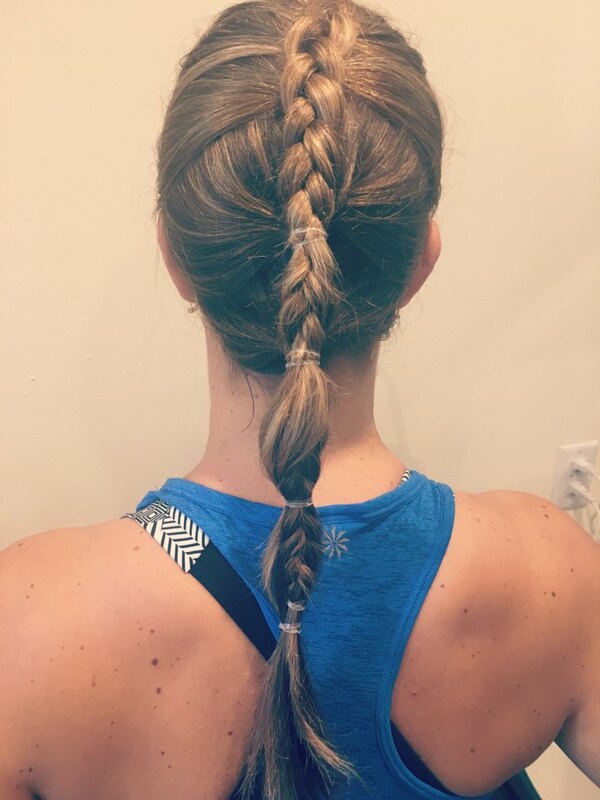 In fact, I did the double braid style below (after seeing Jess from The Fit Petite rocking the look at Camp Brooks) the day before working from my local coffee shop, and I had people coming up to me to ask about it all morning! This style is awesome for hair of various lengths and textures — and it really only takes a moment! What you’ll need: One small clear elastic, one regular elastic, two bobby pins or a barrette. Step 1: Create a deep side part and separate the hair from that part and a couple inches back from the rest of your hair. Put the majority of your hair in a ponytail. Step 2: French braid the front section. 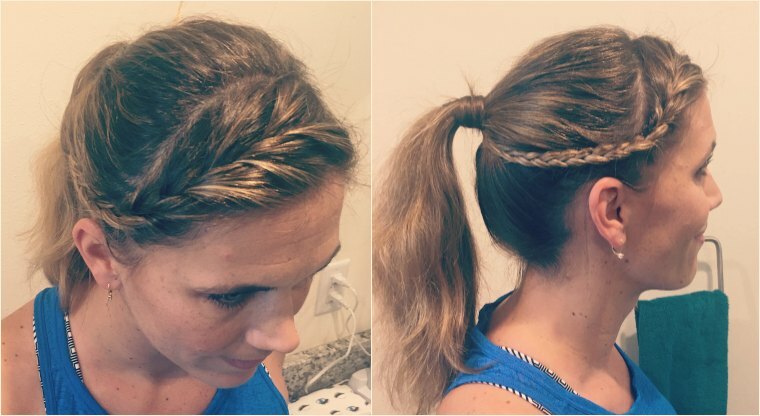 This is an easy way to pull bangs that are growing out away from your face! 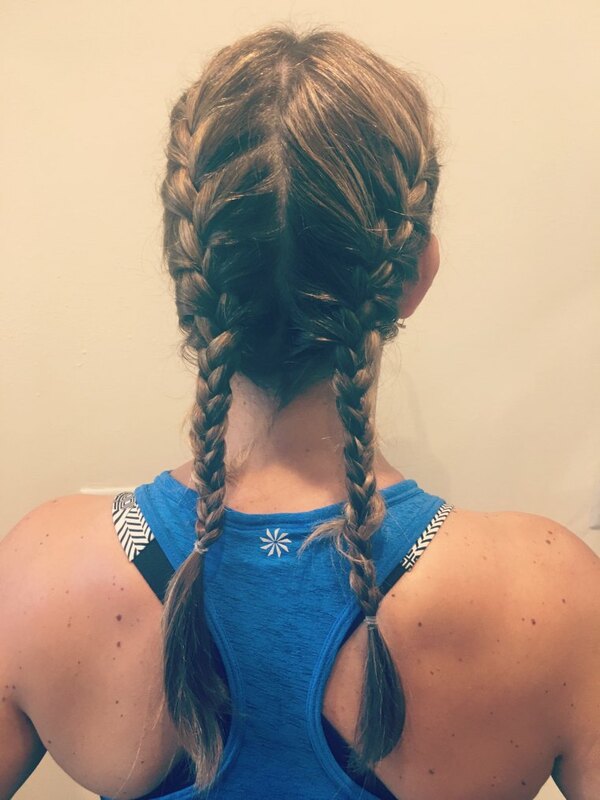 Braid all the way to the end. Step 3: Pull the braid back to your ponytail and fasten with a barrette or two bobby pins. Wrap a section of hair from the ponytail around any ends sticking out to group it in with the ponytail, hide your elastic, and make it look more polished. Got thick hair with lots of texture? Then you’ll rock this style better than I did, but it’s a great way to make your hair look really, really long. I mean, I was going for this … and maybe fell a little short. But I bet you can do it! What you’ll need: Four (or more) clear, plastic elastics. Size will depend on thickness of hair. 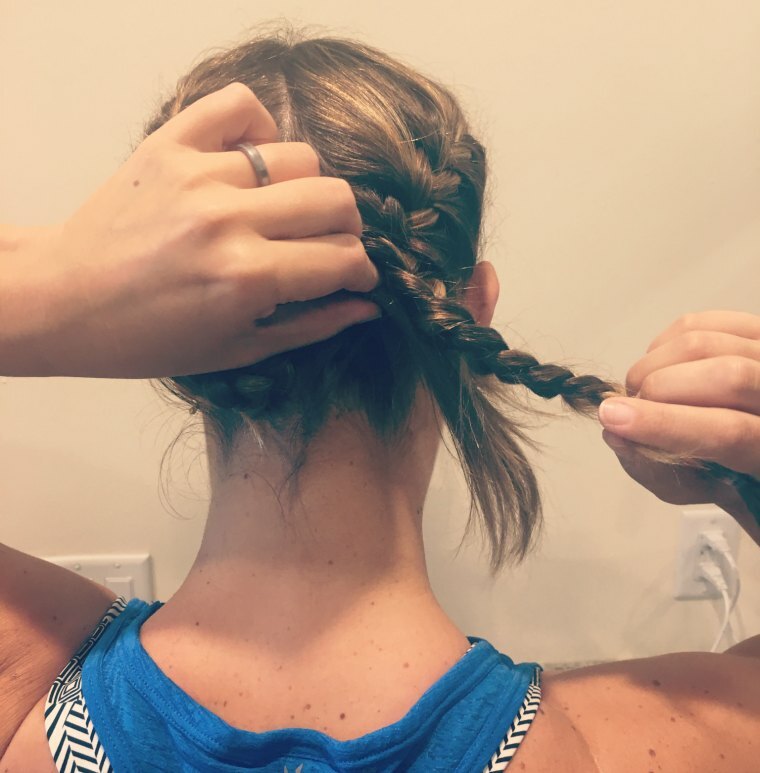 Step 1: French or Dutch (shown here — basically, inside out French braid) the top half or so of your hair. Continue braid all the way to the end. 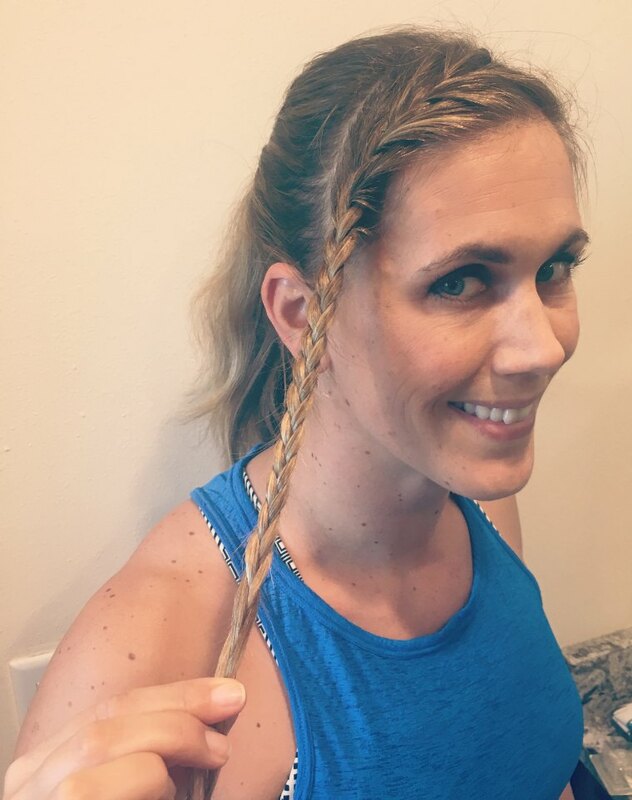 Step 2: Take another quarter of your hair and braid it (unless your hair is so long and thick that your top braid goes to the bottom of your hair, in which case one braid will do!). Keep it a loose and messy. Step 3: Create “bubbles” by fastening your braid and loose hair together and pulling the loose hair out a bit. Do this at regular intervals down to the bottom. It might not hold perfectly all workout long, but it won’t be hard to touch up! This is my favorite of all — I’m rocking it as I type, in fact! It looks waaaaay more complicated than it really is. Promise. 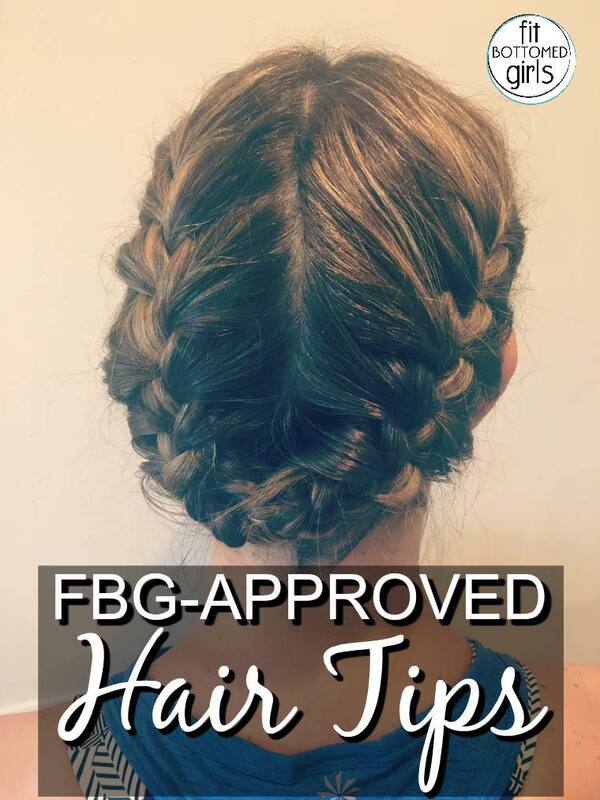 What you’ll need: Two thin elastics (clear is ideal) and four or more bobby pins. Step 1: Part hair evenly down the middle and pull one section tightly out of the way. 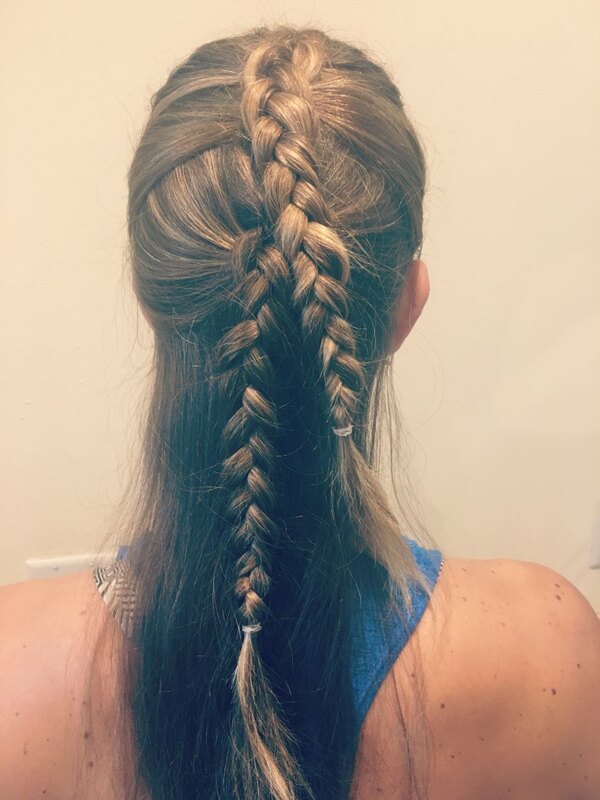 Step 2: French (shown here) or Dutch braid each side — a little loose and messy will work in your favor later, so don’t try for perfection! 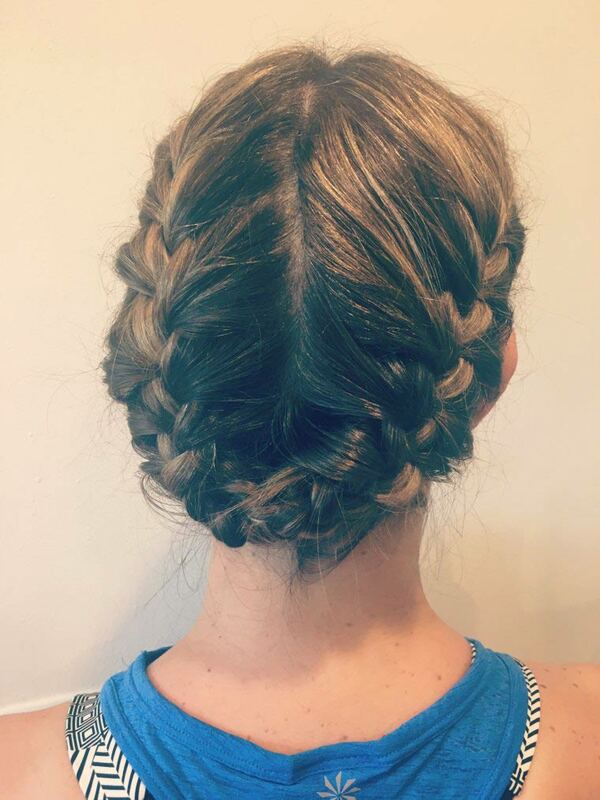 Braid both sides all the way to the ends, even if bits come poking out. Step 3: Shove the end of one side right up under the bottom of the other braid. Secure with overlapping bobby pins. Step 4: Repeat on the other side. Be sure to shake your head around to make sure both sides are fastened securely! Love the hair styles, you put me to shame. I stick with the loose scrunchie. I know it is not fashionable but it is easy on my thin hair. My go to is to put my hair in a medium low ponytail (whatever I can get all my hair into) and then to braid the ponytail. I often wear a headband or thread that braided ponytail through a baseball hat. Somehow, having the ponytail in a braid makes it stay controlled More and it’s less annoying to me than a regular ponytail! Love this post!!! All hairstyles looks amazing. I love to wearing different hairstyles. By your post i got amazing tips about easy hairstyles.